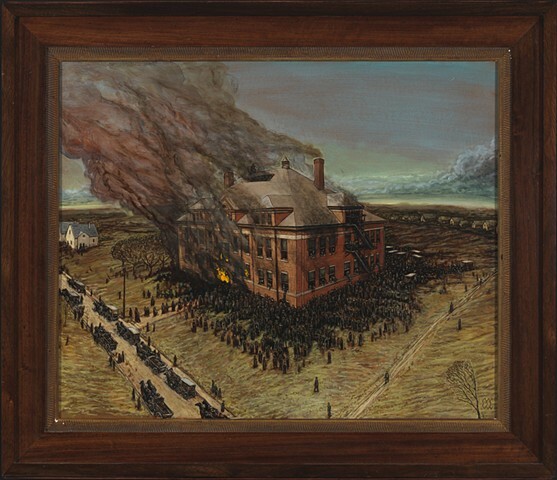 At approximately 9:30 a.m. on Wednesday, March 4, 1908, a fire started in the basement near the furnace, under the front stairwell of the school, which blocked the front door. Panicked children were trapped by a crush of bodies in the doorway of the exit of the rear stairwell, trapping the rest of the students and teachers in the upper floors. The community rushed to the school for rescue efforts only to find an impenetrable wall of bodies at the doors. Unable to help, rescuers could do nothing for nearly four hours but watch in horror as some children jumped from the windows to escape, while others remained trapped in the inferno. Firefighters eventually arrived from 10 miles away in nearby Cleveland, but they were too late. 175 perished including two teachers and one rescue worker.